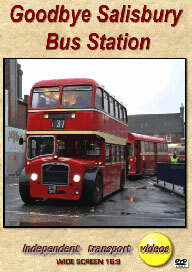 Opened in August 1939, the bus station in Endless Street, Salisbury has served Wilts & Dorset for over 70 years. So it seemed fitting that a special event to mark it’s closure over the weekend of the 4th and 5th of January 2014, should be arranged. This was organised by Andrew Sherrington, the Operations Manager of Salisbury Reds – the trading name of Wilts & Dorset in the Salisbury area, of which Go South Coast is the parent company. A superb selection of vehicles were invited, some from other Go-Ahead companies ranging from Southern Vectis CDL 899, a 1939 Bristol K5G, the oldest bus still owned and operated by it’s original operator, to the latest ‘New Bus for London’ LT119 (LTZ 1119) which had recently entered service with Go-Ahead London. The ‘local’ stars of the day were former Wilts & Dorset vehicles in the shape of Bristol LD6G OHR 919, Bristol RELL6Gs MMW 354G and TRU 947J and Bristol VRT BFX 666T all looking at home in the old bus station. There were also representatives from the fleets of Hants & Dorset, Royal Blue, Bristol Omnibus, King Alfred, Silver Star, Crosville, a Huddersfield Daimler CWA6 in the livery of London Transport and not forgetting two Routemasters. A network of services radiating out from the bus station was arranged so people could experience rides on all of the buses running in service. Services 7 and 8 served Amesbury, home to the small bus station that also closed on the same day as Salisbury. The independent transport videos cameras were on hand to record the event. However, our filming starts the day before, on Saturday 4th January 2014 to film the final day of normal operation at the bus station. Here we see the modern fleet in action which includes the new Enviro 400 double deckers in the dedicated liveries for the X3, X5 and Active 8 services. There are also visits of vehicles from sister company Damory as well as standard Wilts & Dorset and Salisbury Reds branded vehicles. We should point out that the weather on both days was appalling - heavy rain and wind was the order for most of the two days! On the Sunday morning our cameras were there right from the start to record many of the arrivals and departures during the day. We also make a short visit to Amesbury. Filming resumes at Salisbury right up until the final departure. At 15.45 the final scheduled departure to carry passengers from Salisbury bus station was made by the four Wilts & Dorset liveried vehicles. A fitting end to an excellent day. We would like to pass on our thanks to Andrew and his team for organising this excellent event. We hope you enjoy our programme!